The Riau archipelago is located just south of Singapore and consists of around 3,000 islands. It straddles the Malacca Straits which are one of the oldest and busiest marine trading routes in the world. Its not surprising then that there are a number of wrecks around the isalnds, the more popular ones are two merchant vessels and a Japanese WWII bomber. The islands are small and close to one another, and the wrecks are usually in shallow waters, island hopping is easy and inexpensive. 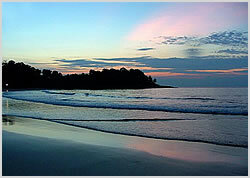 Bintan, the largest island in the archipelago, has a couple of dive resorts but more are based in neighbouring Singapore. Little is documented about specific dive sites in the archipelago but the general underwater topography consists of shallow fringing reef and good coral and macro life, the two main areas for diving lie just at the edge of the equator line. However due to its overall geography visibility is often not as good as other Indonesian dive destinations. Getting there : Ferry from Singapore, 30 minutes.